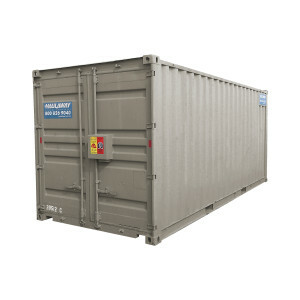 Haulaway Storage Containers is the perfect choice if you need a roll off container in the Los Angeles area. Let our team cater to your temporary storage needs, no matter what they are, by allowing you to buy a roll off container in the size and configuration of your choice. Each Conex container is equipped with ground level double-doors on one side for easy loading, as well as the patented Rhino Lock system to ensure that your materials stay in the exact same condition that they were when you packed them. No matter what the volume of your cargo is, Haulaway is the best-suited roll off container provider in Los Angeles. They can provide you with temporary storage space for as long or short of a time as you need, ensuring reliable, on-time drop off and pick up according to your scheduling requirements. In addition, the quality of the steel-made shipping containers ensure that your items stay secure and protected from any outside elements that could damage them, such as rain or sun damage. Your satisfaction is our priority! To buy a roll off container or receive a free quote, simply contact us through our website at haulaway.com or call toll free at 800-826-9040. Our excellent customer service providers will work with you to figure out which size cargo container would be best for your project, and then deliver it straight to your driveway, yard, or designated storage space. We even place the shipping container according to your preferences and allow you to pack it up as you see fit, before picking it back up and hauling it away, all with prompt and friendly service. Don’t let the task of finding a roll off container in Los Angeles overwhelm you—instead, let Haulaway take care of it!